Along with the well-known authors of the texts included in our courses – Leon Chaitow, Laura Allen, Whitney Lowe, Devin Starlanyl, Dolores Krieger, Gayle MacDonald, Tiffany Field, Nina McIntosh, Cherie Sohnen-Moe, Ben Benjamin, Art Riggs, Ruth Werner, His Holiness the Dalai Lama – the Institute's knowledgeable faculty offer their experience, professional expertise and enthusiasm to you through our organized and comprehensive home study continuing education programs. Author of the Nerve Mobilization program, Doug Alexander holds a Bachelor of Science Degree in Biology and earned his massage therapy diploma in 1985. He has worked in various massage settings since 1985 and established his own private practice in 1993. With over 30 years of professional experience, Doug has written articles for Massage Therapy Journal, Journal of Bodywork and Movement Therapy and the Journal of Soft Tissue Manipulation. Creator of the Auth Method® of therapeutic massage, Shari Auth's work is truly holistic in that she treats the full person by incorporating her knowledge of acupuncture, Traditional Chinese Medicine and structural integration with massage. Shari holds a Bachelor of Science Degree in Biology and a Masters Degree in Traditional Chinese Medicine, in addition to being licensed as a massage therapist and acupuncturist. The accolades from her list of celebrity clients demonstrate her passion for alternative healing. Through many years as an instructor, trainer and author - as well as 17+ years in practice - Shari has provided great contributions in the alternative healthcare field. Shari is the author and instructor of the Forearm Massage - Auth Method® continuing education program. As a pharmacist licensed in the states of New York and Kentucky, Mr. Baisley has been practicing pharmacy since his graduation from the Albany College of Pharmacy, New York in 1971. Earning his Masters Degree in Health Services Administration, William has also co-authored published articles in the German Journal of Psychiatry and Journal of Developmental and Physical Disabilities. Mr. Baisley is co-creator of the Institute's Medical Errors and Pharmacology and Massage programs. Andy Bernay-Roman, Licensed Mental Health Counselor (LMHC), Nationally Certified Counselor (NCC), Licensed Massage Therapist and Registered Nurse works in his private psychotherapy practice in South Florida. Andy was a 1995 nominee for the Norman Cousins Award and the Rosalyn Carter Caregiver Award. Mr. Bernay-Roman has also served since 1990 as mind/body psychotherapist at the world-renowned Hippocrates Health Institute in West Palm Beach, Florida, where he treats individuals, couples, and families, and also facilitates the ongoing Healing Circle. Andy authored the Mind/Body Connection and Psychoneuroimmunology for Bodyworkers course manuals. Sharon Burch holds a Masters Degree in Nursing and has been practicing as a nurse since 1974. She is currently a Registered Nurse in the state of Arkansas. 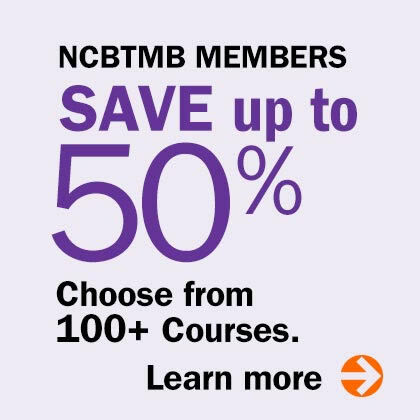 Additionally, Ms. Burch studied under many of today's leaders in massage therapy and bodywork during the 1980s, became Nationally Certified through the NCBTMB in 1993 and holds a professional membership with the AMTA. As founder of Health Positive!, Ms. Burch has created over 60 home study nursing and massage continuing education programs, performed over 65 public, live educational presentations, has written two published books, served as a member on the NCBTMB Continuing Education committee and was a founding member of the National Association of Nurse Massage Therapists. Sharon is an instructor on many of the Institute's programs and has authored and co-authored various ethics courses and additional titles such as Touch for the Seriously Ill, Stress Reduction Through Bodywork, Staying Well – Naturally, Cardiopulmonary Health and Illness, Chronic Pain Management, Marketing Massage in Four Easy Steps, Preventing Medical Errors, HIV Update for Massage Therapists and Bodyworkers, Understanding HIV, Massage for Edema and more. Nicole Cutler is a long time advocate of integrating perspectives on health. With a Bachelor of Science degree in Neuroscience from the University of Rochester and a Masters Degree in Traditional Chinese Medicine from Five Branches Institute, Nicole has been a licensed acupuncturist since 2000. She has earned acupuncture licenses in the states of California and New York, is a certified specialist with the National Acupuncture Detoxification Association, has earned diplomat status with the National Commission of Chinese and Oriental Medicine in Acupuncture and Chinese Herbology and is a member of the Society for Integrative Oncology. In addition to her acupuncture practice that focuses on stress and pain relief, digestion, immunity and oncology, Nicole contributes to the integration of healthcare by writing articles and courses such as Infectious Disease: Hepatitis for health care providers. Leslie L. DeMatteo, LMT, MS, has been an active massage therapist since 1998, after graduating from the Sarasota School of Massage Therapy in Sarasota, FL. There she completed the massage therapy program along with a certificate program in Nuad-Bo-Rarn: Traditional Massage of Thailand. Since then, she has completed continuing education in cranial-sacral fundamentals, cancer and mastectomy massage, reflexology, trigger point therapy and prenatal massage. She is also certified by the National Certification Board for Therapeutic Massage and Bodywork (NCBTMB) and is a Professional Level member of Associated Bodywork and Massage Professionals (ABMP). Her work in massage therapy continuing education and teaching in a massage school ignited a passion for adult training and education, which led her to pursue her Bachelor's Degree in Adult Learning: Vocational Instruction, followed by her a Master's Degree in Adult Learning. Ms. DeMatteo is the instructor for the Institute's Advanced Prenatal Massage. Linda Fehrs attended both the Swedish Institute of Massage Therapy and Hudson Valley School of Massage Therapy in New York – a state with some of the most rigorous licensing requirements in the U.S. – and also served as an instructor at the Hudson Valley School of Massage. She is a professional member of the AMTA and the New York State Society of Medical Massage Therapists. Linda has actively practiced massage therapy in the Mid-Hudson Valley since 2002 with a focus on medical massage and massage for those with special needs, such as developmental and physical disabilities. 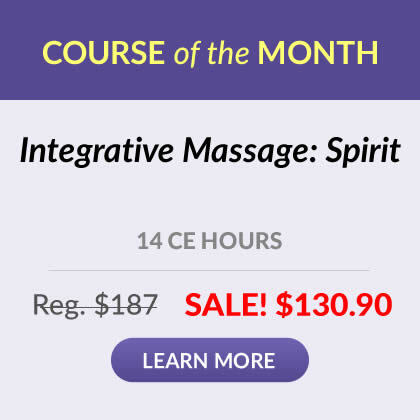 Ms. Fehrs has authored such courses as Build Your Massage Practice, Cancer & Massage, Women & Massage as well as Marketing Massage and the Economy. luxury spas to the US Open Tennis Tournament to a hospice to now, exclusively, his own private	practice, Full Breath Massage. And he has developed and taught continuing education courses around	the country, from the Swedish Institute to the AMTA National Convention. His aim, both with his	clients and in his teaching, is to enhance self-awareness, so that we can do the things we love with	efficiency and ease. Mr. Lobenstine is the creator and instructor of Pour Don't Push. Dr. James R. Mally graduated from massage school in 1976 with over 1,000 hours of training, later attending Bastyr College of Naturopathic Medicine earning a Doctor of Naturopathic Medicine degree in 1984. As the founder of the Healing Arts Institute, a massage therapy school in California, Dr. Mally is an administrator and teacher of anatomy and physiology, massage, business, ethics, deep tissue massage, sports massage and other courses. Dr. Mally has had over 30 years of teaching experience in the massage and healthcare field. Dr. Mally is author and instructor for the Institute's Deep Tissue Massage, Sports Massage, Swedish Massage for Professionals and Side Lying Massage courses. Original founder of the Institute for Integrative Healthcare Studies, Ralph graduated from The Swedish Institute, New York in 1981. A New York State Licensed Massage Therapist, Ralph was also the associate producer and host of the Holistic Health and Wellness and Natural Wellness programs in White Plains, NY, the creator of the Loving Pregnancy Massage video and author of the Healing Energy & Touch course manual. Ralph has also authored and co-authored additional courses with the Institute including Developing a Wellness Center, Prenatal Massage Fundamentals, Infectious Disease: HIV/AIDS, Infectious Disease: Hepatitis, Medical Errors, Ethics: Therapeutic Relationships, Advanced Anatomy & Physiology, Deep Vein Thrombosis and Ethics: Practice Management. Laura Norman is a nationally recognized reflexologist, New York State Licensed Massage Therapist and author of the Institute's Reflexology program. For more than 30 years, she has pursued her mission of making reflexology understood, appreciated and available worldwide. As the authoritative voice of reflexology, Laura has appeared on national television programs such as "Good Morning America,"; "Good Day New York"; and "Extra. "; Newspapers such as The New York Times, The New York Post, The New York Daily News, The New York Newsday, The Chicago Tribune and The London Times and magazines such as Town and Country, GQ, Prevention, Cosmopolitan and New York Magazine have featured her work. David Palmer began his professional massage career in 1980. He began working with chair massage in 1982 as a way of making skilled touch more accessible to the mainstream public. For his pioneering work in bringing chair massage into public consciousness, David Palmer has been acknowledged by Massage Magazine as the "father"; of Chair Massage. In November 1997, David also received the prestigious President's Award from the American Massage Therapy Association for his meritorious service to the profession. Through the founding of the Touch Pro Institute, David has trained tens of thousands of practitioners in the techniques and marketing skills of chair massage. Mr. Palmer is the author and instructor of Chair Massage Fundamentals. Sean Riehl has been a bodyworker since 1998 when he completed his training program through the Body Therapy Institute in California and subsequently served as an instructor there. Certified in Lymphatic Drainage, Visceral Manipulation, Neuromuscular Therapy, Muscle Energy Techniques, Myofascial Release and Shiatsu, Mr. Riehl established Real Bodywork in 2000 producing high-quality, professional, instructional massage and yoga videos. With over 40 video titles, Real Bodywork is the preeminent producer of videos in the massage training industry. Mr. Riehl is author, co-creator and instructor on various Institute courses including Neuromuscular Therapy & Advanced Deep Tissue, Lymphatic Drainage Massage, Myofascial Release, Advanced Anatomy & Pathology, Clinical Massage Therapy, Integrative Massage: Earth, Fire and Spirit, Nerve Mobilization and more. Sheryll Ryan completed extensive aromatherapy training, including the certification course from the Pacific Institute of Aromatherapy taught by Kurt Schnaubelt, PhD. She also traveled to Europe to learn firsthand how essential oils were distilled and how the modality was practiced. Back in the United States, Christoph Streicher, PhD was her mentor in the analysis of oils, aroma-chemistry and aroma-physiology. And, most importantly, private sessions with over 400 clients led Sheryll to objective conclusions on the actions of aromatherapy and individual essential oils. Ms. Ryan served on the Education Committee as the Western District Director and on the Executive Committee of the National Association for Holistic Aromatherapy (NAHA). Sheryll Ryan is the author of the Aromatherapy Essentials course manual. K.P. Khalsa is a certified massage and bodywork therapist through the NCBTMB, a Registered Herbalist through the American Herbalists Guild, a Certified Dietician-Nutritionist in the State of New York and a Registered Counselor in the State of Washington. He has had over 30 years of experience in alternative medicine, and is one of the foremost herbal experts in North America. K.P. Khalsa is a respected teacher, having served as faculty at Bastyr University, National College of Naturopathic Medicine and AYU Ayurvedic Academy. As a writer and lecturer, he has presented at well over 120 national conventions and conferences. K.P. has authored or edited over 26 books, including the Institute's Fibromyalgia and Massage course manual. Irene was certified through the Los Angeles School of Massage in 1974. She introduced massage into hospice care on the West coast in 1982. Since that time Ms. Smith has worked with hundreds of clients in hospital, home, hospice and skilled nursing environments. Her private as well as organizational involvement with the seriously ill has included AIDS, Parkinson's, Alzheimer's and cancer in all stages of illness. Irene was the founder of Service Through Touch, an internationally acclaimed organization providing and teaching touch as an integrative component to AIDS care. Irene has been acknowledged by the massage and somatic communities, the health care community, and through the media for outstanding contributions to society's well being. She is currently the founder and director of Everflowing, an educational outreach project dedicated to teaching touch as an integral component to end of life care. She continues to teach, consult, create educational resource materials and maintain a private practice in San Francisco, CA. Irene has authored and co-authored Institute programs, such as Touch for the Seriously Ill, Understanding HIV, HIV Update for Massage Therapists and Bodyworkers and Hospice-Based Massage. Mary Sullivan received her massage training through the Santa Barbara School of Massage in 1981 and continued her education, earning her license in Acupuncture. As a faculty member of the Body Therapy Institute since 1991, Ms. Sullivan has taught such courses as Cranial-Sacral, Lymphatic Drainage, Polarity Therapy and Pregnancy Massage. She also holds certifications in Cranial-Sacral Therapy, Pre and Perinatal Massage and Polarity Therapy.Mary is the author and instructor of the Polarity Therapy and Cranial-Sacral Fundamentals courses.